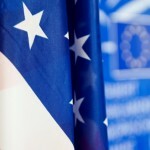 International regulatory cooperation is a central component of current U.S. efforts to negotiate international trade agreements, such as the Transatlantic Trade and Investment Partnership (TTIP) with the European Union and the Trans Pacific Partnership (TPP) with 11 countries throughout the Asia Pacific region. As traditional barriers to trade decline, understanding regulatory impacts on trade and investment is of particular importance for economic growth. 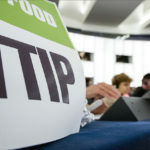 To illustrate, in 2013, transatlantic trade accounted for $1.06 trillion in goods and services traded and transpacific trade added another $1.8 trillion. We examined the performance of executive branch agencies in consistently identifying regulations they are promulgating that will likely have a significant impact on international trade and investment. Our forthcoming research suggests that there is room for improvement in this process, due mainly to agencies inconsistently identifying or failing to flag regulations that are likely to affect international trade and foreign direct investment (FDI). 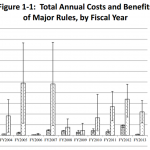 Our analysis utilizes the database at Reginfo.gov to look at seven years of economically significant rules – those defined in Executive Order 12866 as likely to have “an annual effect on the economy of $100 million or more.” This database includes regulations issued by executive branch agencies that are subject to OMB review under E.O. 12866, and as such, does not have data for rules issued by independent regulatory agencies (such as the Securities and Exchange Commission). Independent regulatory agencies are merely “encouraged to comply with the provisions” in E.O. 13609, and other executive orders. 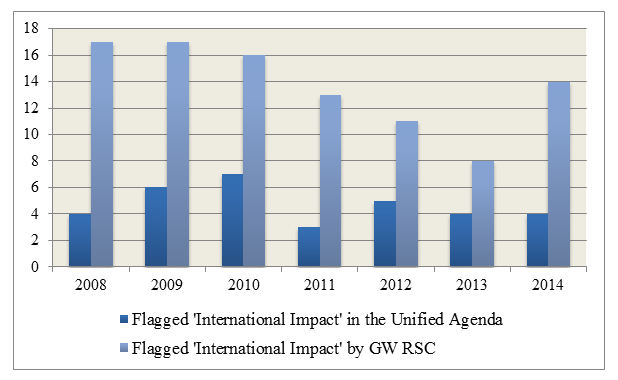 Our analysis begins in 2008 because that was the first year agencies began flagging regulations as “internationally significant.” Our findings show that within seven years, agencies flagged 33 economically significant rules as having a likely impact on international trade and investment in comparison to 96 rules flagged by the George Washington Regulatory Studies Center. Our review reveals that agencies were consistently inconsistent in their labeling of similar rules. For example, the Department of Energy flagged its rule governing “Energy Conservation Standards for Commercial Refrigeration Equipment” as having an international impact but not a similar rule addressing “Energy Conservation Standards for Walk-In Coolers and Walk-In Freezers”. Such inconsistencies were also common for regulations affecting Agriculture and Transportation. The results also show that agencies such as the Department of Labor, Department of the Interior, and the Environmental Protection Agency are not identifying economically significant regulations that would likely have a significant impact on international investment – namely FDI particularly in the Mining and Oil & Gas sectors. These oversights ignore regulatory effects on two sectors that, together, comprise almost 20% of FDI within the United States. According to the Department of Commerce,FDI inflows for 2012 totaled $166 billion. These findings suggest that agencies could work more consistently to identify which of their regulations are likely to have a significant effect on international trade and investment. In addition to consistently flagging rules that directly affect traded goods, agencies should also identify regulations that directly affect FDI within the U.S. There are potentially sizeable economic gains to be realized from improved international regulatory cooperation, and these changes could aid efforts to avoid creating unnecessary barriers to trade and investment flows. 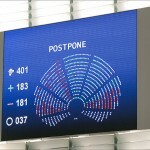 In addition, they could improve the outcomes of international cooperative forums, such as OMB’s Regulatory Working Group and provide international trading partners an opportunity to have more transparent and advanced notice of rules – allowing them to more successfully participate during the notice-and-comment period.